The watches in the Classique collection are part of Breguet's long watchmaking tradition. The models in this series contain the most modern technology beneath their high-quality gold or platinum cases. The Classique series by Swiss watchmaker Breguet is characterized by a classic wristwatch look. The company, based in L'Abbaye, benefits from more than 200 years of watchmaking tradition. Over the last two centuries they have developed countless innovations that have made lasting changes to the watchmaking industry. Among these are the tourbillon, which improved accuracy; the pare-chute shock-protection system; and the silicon magnetic pivot. The Classique 5347 Grand Complication, introduced in 2006, features two tourbillons on a rotating plate connected by a differential gear. Breguet's founder, Abraham-Louis Breguet, spent decades revolutionizing the art of watchmaking. In 1775, he opened a shop in Paris and established a clientele of kings, tsars, and emperors. Among his most prominent customers were the French queen Marie Antoinette, Tsar Alexander I of Russia, Napoleon Bonaparte, and Winston Churchill. The watch Breguet designed for Marie Antoinette is still considered one of the most intricate pocket watches in the world. This piece, the No. 160, was completed in 1827, 34 years after Marie Antoinette's death and 44 years after its original commission in 1783. The Classique series of watches follows this tradition steeped in history. They are the highlights of Haut Horlogerie. The Classique collection features a wide variety of models ranging from ultra-thin pieces to incredibly complex grand complications. However, every watch shares a few common traits: a high level of precision and a focus on the core essentials. The Classique Chronométrie is a prime example of this top-quality precision. Breguet introduced the Chronométrie manual wristwatch in 2013. It's powered by the caliber 574DR, which is comprised of an anti-magnetic silicon pallet lever, escape wheel, and balance spring. The balance wheel is suspended in position by two magnets - unheard of in the watchmaking world, as magnetic fields were long considered harmful to mechanical watches. This technology significantly minimizes friction and lowers the energy used by the swing and escapement systems. Due to its steady and frictionless position, the titanium balance wheel moves at 72,000 vibrations an hour (A/h). With a thickness of 7 mm, the Breguet Classique Tourbillon Extra-Plat Automatique 5377 is exceptionally thin. So thin, in fact, that it is one of the thinnest automatic watches in the world. 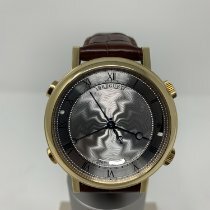 Its 42 mm diameter case comes in rose gold or platinum. The tourbillon, with its titanium carriage, is easily visible on the bottom half of the dial. The watch is powered by the caliber 581DR, which has a frequency of 4 Hz, or 28,800 A/h. This is an unusually high frequency for a tourbillon watch, seeing as they normally have a frequency of only 3 Hz, or 21,600 A/h. The power reserve indicator lasts for 80 hours, thanks to the patented high-energy barrel. It is located at the 8:30 position, while the decentralized seconds is situated at the axis of the tourbillon. The caliber is only 3 mm thick and contains 42 jewel bearings. The dial of the men's watch is 18 karat gold and features the traditional Breguet geometric guilloché, which is done by hand. The Classique series unsurprisingly emphasizes a classic design. The round cases are decorated with vertical, finely textured grooves in the center of the dial. These markings are a recognizable characteristic of Breguet timepieces. The dials are either hand engraved with a guilloché pattern or made of Grand Feu enamel. More modern versions feature dials decorated with the classic Breguet numerals, designed in 1790 by A.-L. Breguet himself. 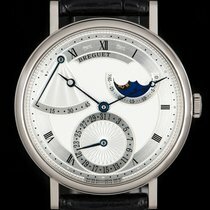 The Breguet hands, with their distinctive moon tip ends, are another trait unique to Breguet pieces. In 1795, A.-L. Breguet created a secret signature of authenticity for his watches. This is engraved on every Breguet watch and is visible only under oblique light. Wristwatches from the Tradition collection likewise carry this special mark. This series contains models that are a balancing act between historic watchmaking tradition and the visions of the manufacturer. Modern materials, such as titanium or silicon, are harmoniously paired with more classic materials, such as gold or steel. The Reine de Naples series, featuring more delicate pieces, is designed with women in mind. The series pays homage to the very first wristwatch that A.-L. Breguet made for Napoleon's sister in 1810. The Marine series, on the other hand, is more sporty and reminiscent of the sea. The Marine watches retain the classic characteristics of a Breguet watch, but interpret them in modern ways.